I bake for work so I think that this would be perfect for me. I have pinned so many baked goods on Pinterest. Let’s see. I’d start with white chocolate cherrie blondies, and continue with Nutella sea salt fudge, mango coconut bars and even strawberry coconut cake. I would love to make the Salted Caramel bars…brownies, lemon bars. The list of possibilities is really endless. I send lots of goodies to work for my Husbands employees so these would be great! I would probably make some sort of dessert bars to start off with chocolate and peanut butter come to mind 🙂 ! These would also be good for my make ahead pasta dishes so freeze and bake in the same container would be wonderful! I would love a set of these. I could bake a bunch of stuff. I really want to try those Salted Caramel Shortbread Bars, They sound yummy! That looks super convenient! I’d love to be able to bring stuff to my floor hockey games in it. Thevsquare one is perfect for brownies! My husband is a coach for a college baseball team…I am the official “team” baker! I am always on the lookout for transportable, strudy bakeware with lids! These look perfect. My 11-year-old son is learning to cook, so he would have a great time experimenting with these. After all, don’t you want to help with the culinary imagination of a young boy? Those Chinet people would want to know just how “boy-proof” (or “boy-friendly”) their wares are. BTW, why do you put the deadline as EST? We are in Daylight Time now. Love the look of them! I’m always trying out baking recipes for the office – but it’s always a hassle to track down the empty pans. I’m not always thrilled with the results of disposable foil pans – so this looks awesome! WOW!! I love baking, I guess the first thing I would make in the disposable bakeware would be cookies. They are my favorite things to bake! I would make some chocolate chip blondies! I bake for my family and friends all of the time. I think that I would start by making a pan of smores bars. I’m always bringing baked goods into work (my coworkers are my guinea pigs), so these would be perfect for me! It would be perfect for the lemon bars and the banana cake I make. I would first make marshmellow fudge brownies. They are so hard to transport from one dish to the next. Then I would make salted caramel shortbread bars. I love baking and I do most of it for others, this bakeware would be perfect! I am always baking for the customers at my store so this would be perfect to transport all the goodies!!! I’ve been baking a ton of treats for my local moms group and their children. These would be great for me to use to transport them. I’m thinking lots of brownies, and maybe a casserole. These look fun! What an AWESOME product! I would make my famous brownies! 90% recycled materials is awesome! I’m happy that they went that route! I would use one to make my famous (in my circle, haha) roasted garlic spinach artichoke dip, one to make and store cake balls and possibly some Grandmas Texas sheet cake! I bake for work and my sister’s tailgates…no more missing pans with this stuff! The last truly addictive thing I made were these rolo caramel fudge brownies. I would make them again and bring them to work. So delicious, and that way I wouldn’t eat them all at home. Always cooking for the kids and their friends all weekend long. These dispoables would make the whole process a lot easier! I would try the salted caramel shortbread bars in a rectangular pan and some sort of warm dip, like spinach-artichoke, in an oval pan. I would bake brownies they are a family favorite. Those salted caramel bars sound amazing! Brownies or anything I would take to a party! Great giveaway! I would make brownies to send to school for my son’s birthday party! 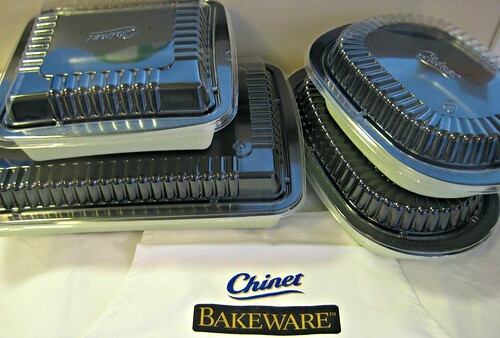 oh man, after the last post i went to two stores looking for the chinet bakeware but they must not be in my region yet. i bake a ton for church and friends so i would start with a casserole or brownies. Uh yeah, I just need a reason to make those salted caramel bars and trying these pans would be an excellent reason. I’d love to just make some simple brownies for a picnic. These would make a great, lightweight container!